TURKEYS ON THE SUNLOUNGER: the America I didn't expect.....: Penny for the - What? Penny for the - What? A mystery spotted outside the library. Now in my day, back in Britain, my first thought would have been "Penny for the Guy". 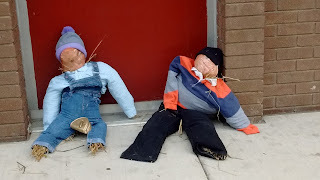 For the benefit of my American friends, British kids used to - maybe still - stuff dummies representing Guy Fawkes and exhibit them to get money for fireworks and then they's be burnt on a bonfire on 5th November. But what they're doing in America beats me. Probably something to do with Halloween. Could it possibly be that, for once, a British Guy Fawkes custom has invaded American Halloween and not the other way around? There's always hope.